Happy 20th anniversary to the Acadian & French-Canadian Ancestral Home! Somewhere along the way when this server updated, all of the french accents on my web site changed to this: ? to go through the many pages to make all of those corrections. Thank you for visiting AAH! 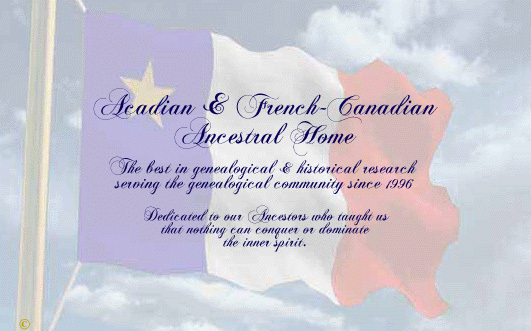 Since 1998, the Acadian & French-Canadian Ancestral Home established its presence on the Internet. Since August 2002, it has been nested in its own domain, www.acadian-home.org. This site is chuck full of research materials such as genealogy, historical documents, parish registers, early American newspapers, suggested research aids, and various documents related to our Acadian history as well as French-Canadian, Cajun and Franco-American ancestry. You will find data relating to the Acadian Deportation, lists of exiles, lists of prisoners, ships' lists, census records, family genealogies, mtDNA results and so much more. You will find new information is posted daily. The Acadian Ancestral Home is grateful to Stephen A. White, Centre d'etudes acadiennes, Universite de Moncton, Moncton, New Brunswick, Canada, for the contributions made in providing accurate information for researchers who visit this site. It is always a privilege and an honor to share his work. You can navigate this site in two ways: 1) through the sidebar to the left (recommended); or 2) through the search engine located at Research Aids toward the bottom of the sidebar. Information on this web site has been researched and confirmed as much as possible. Sources are, as a rule, indicated at the bottom of each page. Though a great deal of information is on the Internet today, some of it is fraught with errors. Every effort has been made to avoid errors by using the most reliable sources available. Although this site presents the most accurate information possible, all researchers should consider verifying and researching their own personal information from primary and secondary sources. This is recommended because standard genealogical research practice is to always seek data from more than one source, and to be confident about your own research, it is a good idea to conduct further research via genealogy books, parish registers, census records (and their correct interpretation), vitals, etc. The research on this site was conducted by Lucie LeBlanc Consentino, genealogist and historian. The information gathered here and the presentation of this information is protected under U.S. Copyright Laws. A Special Thank You To Our Visitors. Thank you for making the Acadian Ancestral Home your home. AAH will celebrate its 19th anniversary this year. Sincere thanks to the more than one million visitors who make the Acadian Ancestral Home such a huge success each year. Because of you, the Acadian Ancestral is encouraged to continuing growing. Enjoy your visit and come back often!